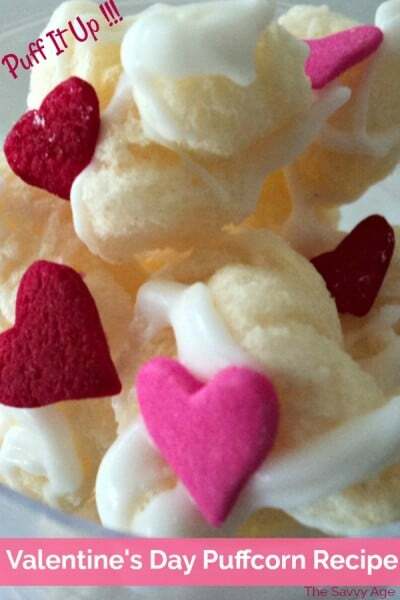 Bring out your puffcorn, Valentine’s hearts and sprinkles to make this addictive, yummy and affordable Valentine’s Day Puffcorn recipe. Your guests will thank you immeasurably! 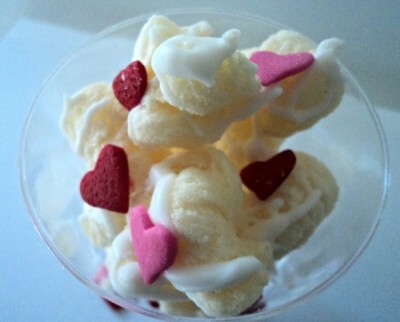 Valentine’s Day Puffcorn is a Valentine’s Day food craft as this is much more an easy Valentine’s Day craft than a recipe. This is my favorite Valentine’s Day snack! Puffcorn is a hullless popcorn which is made by many brands in many flavors. For this recipe the plain or buttered flavor puffcorn works best. The consistency of puffcorn is akin to a cheese puff that tastes like popcorn or buttered movie popcorn. The benefit of puffcorn is no hulls which equals no kernels which equals safe dental work and a delicious flavor. I love Chester’s Butter flavored puffcorn as the taste mimics movie theater popcorn with butter – adding the white chocolate gives the sweet salty mix we all love. However, any brand works well and organic brands of puffcorn are also available; popular brands in my area include Old Dutch, Herr’s and Better Made. I love the larger size hearts by Wilton which can be difficult to find on the shelf so plan early and order online if needed. I purchase the hearts and jimmies online. Ten minutes to prep. Ten minutes to set. And you are on the way to making Valentine’s Day snacks for a party, classroom or the family! Lay out puffcorn in one layer on a parchment or wax paper lined cookie sheet or my new favorite Reynolds baking sheets. Leave a slight space between each puffcorn. I use two cookie sheets for one bag of puffcorn. Melt the chocolate in the microwave. If you haven’t melted chocolate in the microwave, try a test batch first to judge how long it takes to melt the chocolate with your microwave brand and wattage. Lightly sprinkle the chocolate or bark over the puffcorn; do not pour. I use a wooden spoon and drizzle the chocolate over the puffcorn. Using the decoration of your choice, liberally sprinkle the decorations over the puffcorn. The mixture needs to set either on the countertop or can be put into refrigerator for a quick set; 10 minutes in the refrigerator is adequate. Break apart the puffcorn into bite size or hand size portions. This is a flexible recipe depending upon your preference for how heavily to coat the puffcorn with chocolate. You want to drizzle enough chocolate to add taste and that the decorations adhere to the puffcorn, but not overload the puffcorn with the sweet topping. The salty puffcorn and sweet should combine evenly. That’s it! Couldn’t be easier. 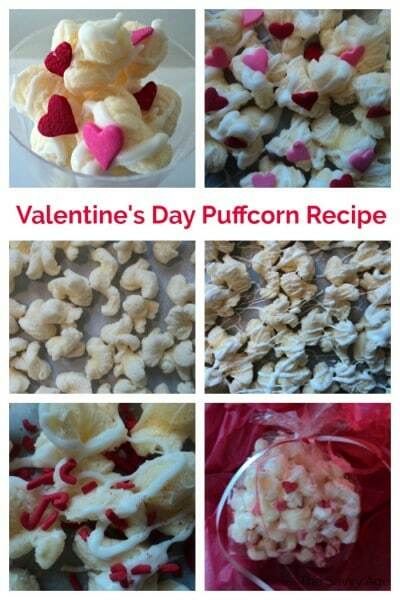 Great recipe to involve the kids to decorate the Valentine’s Day Puffcorn and affordably feed a crowd, classroom or party. Enjoy this sweet and salty Valentine's Day snack. No one can eat just one! 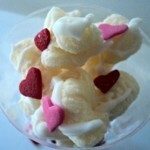 Yummy and economical for a Valentine's Day party or party favor. Melt the chocolate in the microwave. If you haven't melted chocolate in the microwave, try a test batch first to judge how long it takes to melt the chocolate with your microwave brand and wattage. This is a flexible recipe depending upon your preference for how heavily to coat the puffcorn with candy melts/white chocolate. You want to drizzle enough chocolate to add taste and that the decorations adhere to the puffcorn, but not overload the puffcorn with the sweet topping. The salty puffcorn and sweet flavors should each shine.